Touted to be supernatural horror film, Starring Karthi, Nayanthara, Sri Divya in lead roles. The movie anticipated to release on Mid 2016. The music of Kashmora composed by Santhosh Narayanan and cinematography handled by Om Prakash. The shooting has been commenced on January 2016 and set to wrap in June 2016. Check out below for the Kashmora Movie Audio & Songs, Teaser, Trailer release date details. Here is the complete details about actor, actress cast and other technical crew members of the movie. The much awaited Karthi and Gokul collaboration is all set to entertain on silver screen soon. The post production of the flick going in full swing and anticipated to reveal soon. The team announced complete technical crew of the film was gathered with Santhosh Narayanan signed on as the music composer, Om Prakash as the cinematographer and Editing of the film to done by V J Sabu Joseph. Nayanthara has been signed as female lead lady and the supporting cast of Kashmora movie ensembles some prominent names which includes Sri Divya, Manisha Yadav, Vivek, Siddharth Vipin, Jangiri Madhumitha and others. Reportedly, The film anticipated to release on August 2016. Meanwhile check out teaser, audio and trailer release date of Kashmora movie below. According to the source Karthi’s starrer release date to announce by the team officially after starting post production work of the film. 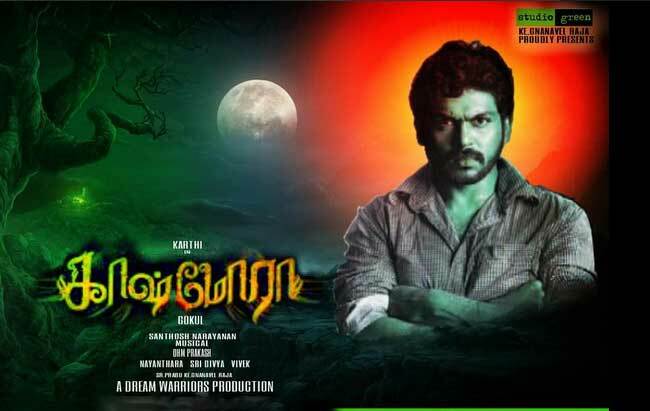 Karthi Kashmora Release Date: Get upcoming tamil movie Kaashmora release date details starring Karthi, Nayanthara, Sri Divya and movie song, teaser, trailer release update.